I’m Amelia Oakley, a London-based photographer. I shoot portraiture, still moments, strangers, peculiar buildings–whatever intrigues me. I always try to capture a story when I take a photograph, whether it’s immediately apparent or not. I mainly shoot portraiture, yet recently I embarked upon a project to photograph the exterior of my home at night, which is in some ways a consolidation upon last year’s Home project. I have reversed the warm, homely shots of last year and am currently working using solely film to document the oddities and mystery of the hours of darkness. Armed only with a camera and a torch, I am trying to capture not only the stillness of this time, but it’s ethereal nature and the intrigue of the night’s potential. I am a Londoner, born and bred. No matter what happens, wherever I go, I’ll likely always end up back here. My rhythm is in sync with here. I want to travel as much as I can, in fact I am spending next summer in Vietnam, but London will always lure me back. There are so many people who are heroic or inspiring to me; every so often I’ll stumble across someone new, a photographer, a poet, an artist, and their work will just engulf me in the most pleasant way possible. But, ultimately, the most heroic people to me are people who fight for a voice; for their voice, for their friend’s voice, for their dead’s voice. I have had the pleasure of speaking to numerous Holocaust survivors and their voices affect me indefinitely. Atonement by Ian McEwan is the novel I read ceaselessly; I have had to replace my copy due to it wearing out. It captures the essence of storytelling throughout the novel and again, internally, within every word. It’s a masterpiece. I love autumn evenings, lemon tarts, lipstick, the sound of sirens, and words. I hate spitting rain, the Twilight Saga, politicians, impertinence, and ignorance. Creating. Creating beliefs, opinions, poems, artworks, photographs. I have never been a Comic Book fan. But I’ll say Flash Gordon because I met a real life Flash Gordon once with a wasp stung face and he was wondrous. I sound like such a tourist, but Central Park. Every time I go to New York it is always coated with snow, and I’m a fool for vast expanses of white snow. A: For me, that would be Vietnam, and I cannot wait to explore there. 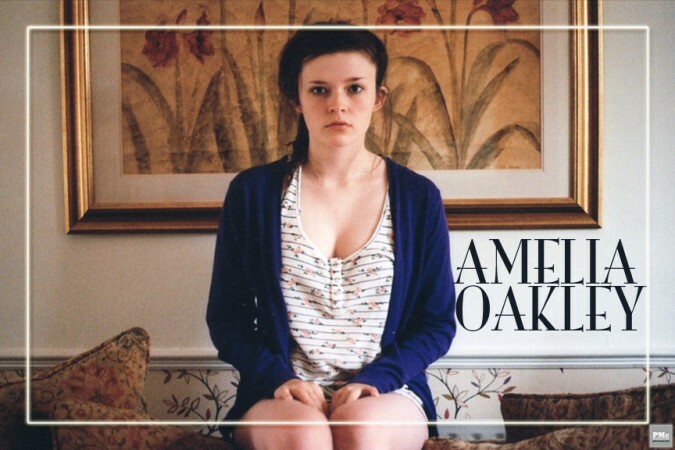 Amelia Oakley is a sixteen-year-old photographer from London. Starting at the age of fourteen, Amelia is untaught and having photographed and experimented for the past two years. She has developed a portfolio which encapsulates her own personal style. Amelia shoots in order to find and photograph stories, whether that involves shooting portraiture of friends, exploring the house of another or capturing the moment of a stranger. Her work is heavily influenced by cinematography and documentary photography and it is this honest and candid nature which she attempts to intertwine into her work. Yet, she is also fascinated by the deceptive nature of the most ‘honest’ artistic medium, and the ability to manipulate a moment and allow the viewer to form their own narrative.